Former Vice President Atiku Abubakar has promised to begin the process of restructuring the country with the first six months of his administration if elected president in 2019. 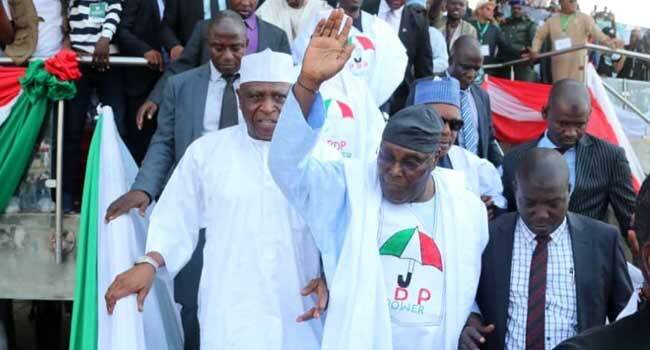 He made the pledged on Thursday at the Peoples Democratic Party (PDP) southwest presidential campaign flag off in Ibadan, the Oyo State capital. Atiku accused the Muhammadu Buhari administration of putting the country in debt, saying it has borrowed so much money in the last three years. He stated that the PDP administration was providing the best educational advancement and job opportunities for the people before the All Progressives Congress (APC) came to allegedly deceive them. “We believed in them; they told us they would give us jobs, prosperity, but instead they gave us menial jobs,” the PDP candidate alleged. The campaign enjoyed the presence of the party’s bigwigs, including its National Chairman, Uche Secondus; Atiku’s running mate, former Governor Peter Obi; and Senate President Bukola Saraki. In his address, Secondus said the nation was in crisis and only the party’s candidate can rescue it from its challenges. He described Atiku as strong, fit and articulate to lead Nigeria and asked the people to cast their votes in favour of the PDP in the coming elections. The PDP chairman insisted that the party was on a rescue mission and called for a minute’s silence for all those who lost their lives, including the late OPC leader Fredrick Fasheun. On his party, Senator Saraki who is also the Director General of the PDP Campaign Council accused the present administration of failing to secure the people and their properties. He urged the electorate to consider Atiku as a better alternative while former Governor Obi noted that the PDP was the only party that can provide good jobs for the masses.